"This is a 'cheaters' iced cappuccino! Very easy to make, and very good!" In sealable jar, combine instant coffee, sugar and warm water. Cover the jar and shake until it is foamy. Pour into a glass full of ice. Fill the glass with milk. Adjust to taste if necessary. I did a new variation of this recipe with great results: decaf coffee crystals, sugar substitute and fat free french vanilla dairy creamer--enjoy, I did. This is not a very tasty drink. ***Add the milk before coffee. I was a barista and learned that coffee directly over ice causes bittering! Simple and easy! 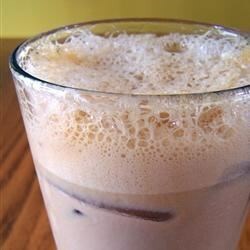 Bottom line - if you're an iced coffe fan, you'll love, love, love it. Wow, this is yummy! Tastes just like Frappucino...and is MUCH cheaper than going to the coffee house!